The fantastic amenities at our apartments in Redmond are designed to impress! Our apartments at The Carter are equipped with all the latest amenities including key-less entry to the building, stainless-steel appliances and quartz countertops in the kitchen, and all of our appliances are LEED gold certified for sustainability. If you like to get outdoors, we offer a two-story bike storage facility and our state of the art fitness facility will help you stay active! Contact us today to learn more! Our Demonstration kitchen, Off The Vine, with large dining room ready to host your next dinner! Grab a cup of custom jo’ at the BrewStation, our deluxe TopBrewer coffee self-serve bar complete with electronic barista! Read a book at The Rook, our peaceful rooftop escape that looks over a protected Heron rookery and the Sammamish River. Tech Bar available for a quick Amazon order or to lookup a bus route. Receive your packages on your own time with 24/7 access to a package storage room. Park your bike at The Big Hanger, our two-story bike storage facility or replace a flat at our custom On Your Left bike work station. Suds up your pup at our complimentary pet wash station. Mingle and enjoy The Heartwood, our interior courtyard with community firepit, outdoor ping-pong table, shuffleboard, grilling station and serene urban forest. Skip your gym membership and enjoy To The Core, our complimentary state of the art fitness facility. Visit The Collection, our on-site museum lobby showcasing world-renowned art of many local and international artists (open to the public!). 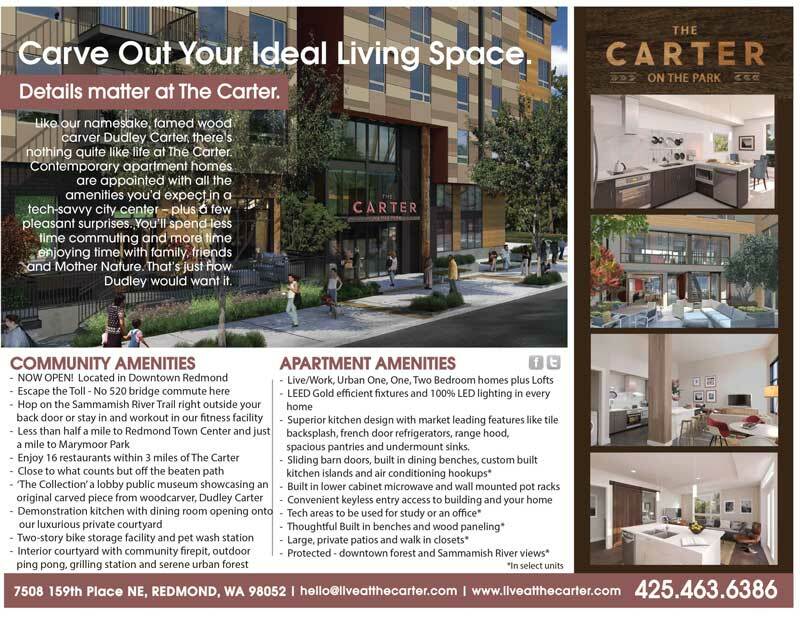 Live/Work, Urban One, One, Two Bedroom homes plus Lofts, Storage Mezzanines, Dens and Tech Areas. Convenient key-less entry to the building and your home. Superior kitchen design with market-leading standard features: tile back-splash, french door refrigerators, range hood, spacious pantries and under mount sinks. Built-in lower cabinet microwave and wall-mounted pot racks standard in all homes. Fiber Internet wired to all units. LEED Gold efficient plumbing fixtures and 100% LED lighting in every home. Concrete or hardwood flooring throughout living areas.